Ben Affleck stars in “Gone Girl.” Photo Credit: 20th Century Fox. 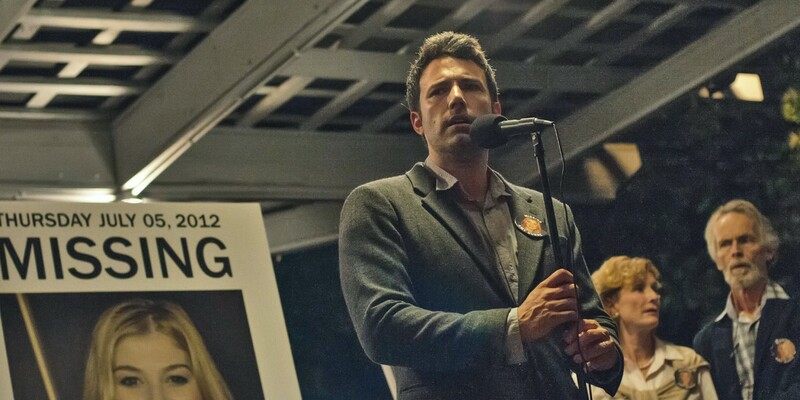 Although Gone Girl is a mystery there was never a question as to whether the movie would be a box-office success. Based on the immensely popular Gillian Flynn book of the same name, 20th Century Fox knew it would have a built-in audience that would line up to see how the story would be adapted. The question really was how well the film would be received. In the hands of the excellent director, David Fincher (Social Network, Girl with the Dragon Tattoo, Seven), and starring A-list actor Ben Affleck (Runner Runner, 2013), the answer was quite well. Gone Girl tells the story of Nick (Affleck) and Amy (Rosamund Pike, The World’s End 2013) a young married couple in Missouri who has a seemingly perfect marriage. One day, when Nick returns home from errands the morning of their anniversary, he finds his wife missing and a glass table flipped over and shattered. As the police investigate her disappearance, we learn more about their marriage through flashbacks from Amy describing their whirlwind romance in New York and the events that led the Ivy League, well-to-do Amy from her ideal life as a big city writer to a stay-at-home wife in a small town in the Midwest. As she describes how their relationship is not as ideal as it seems, the police also begin to suspect the same, and become suspicious of Nick’s potential involvement in his wife’s disappearance. The story has countless twists and turns. This drama-mystery-thriller will definitely have audiences tense throughout the entire movie and talking about the ending, regardless of whether or not they read the book. Of course, given the popularity of the novel, it was assumed that the plot would be engrossing. But the success of the movie really hinged on the performance of its main characters played by Affleck and Pike, with support from Neil Patrick Harris (Cloudy with a Chance of Meatballs 2, 2013) and Tyler Perry (The Single Moms Club, 2014). Affleck, who has been on a roll since Argo (2012), does a superb job playing the frustrated husband and doubling as a potential murder suspect. The lesser-known Pike as Amy delivers as the eponymous Gone Girl who we learn more about as the movie unfolds and who also delivers as the “perfect wife” and when showing an icier side. If she wasn’t in such a high profile film, however, I don’t know if she’d still be receiving the praise that she is now. While Pike certainly delivered, there are several other actresses who could have probably played the role better. The supporting actors, Harris and Perry among others, are strong for the most part as well. In fact, Perry will surprise most audiences who know him more for his critically panned Madea movies as he does an excellent job as a Johnny Cochran-like celebrity defense attorney. Patrick Harris also adds some ambiguity to the movie as Amy’s long-lost ex-boyfriend. Still, the main praise belongs to David Fincher who once again shows why he is regarded as a master of suspense and mystery – even keeping the audience’s attention for the over two and a half hour running time. Long-time Fincher collaborator, Trent Reznor of Nine Inch Nails, does a fantastic job with the score that helps drive the emotional center of the movie. Bottom-Line? Gone Girl is a must see mystery-drama-thriller. David Fincher’s direction still fails to disappoint and Affleck’s acting is excellent. Reading the book before viewing is not a necessity – the film is a thrill ride for all!